With all the major holiday revelries having zoomed past, we are still in the spirit and obviously still craving for more fun and food with family and friends. The weather too is in celebratory mode and since we need just the slightest bit to let our hair down and party, it’s time for winter partyyyyyyss!!!! And what does every winter party festivity call for? A few really delicious party appetizers and of course really great drinks; be it a small gathering or the big game Super Bowl party, delicious winter finger food is always the need of the hour. Americans, like the rest of the world, look at the New Year as a time for fresh beginnings, with hope and resolutions for a better future. Though festivities differ from place to place, with regional variations on well-known customs, most people host parties and attend concerts, set up and enjoy fireworks displays and other special gatherings like game days and movie nights! Some classic American appetizers like spicy wings, crab cakes, chili, corn dog, bacon cheeseburger, barbeque ribs, buffalo chicken wings, and deviled eggs are perfect for everything from game days to graduation parties. Trending winter appetizers include a twist on the classic versions along with more modern appetizers like cocktail meatballs, bacon-wrapped dates with blue cheese, pear and prosciutto bruschetta and winter desserts to tie it all up neatly together. Here’s a round-up of some popular winter party appetizers with their recipes. We are sure you are done with turkey and its leftovers, so we promise to lay off the turkeys, pumpkins, and cranberries. Winter entertaining makes its own style statement, so fuel the fun with these easy appetizer recipes. 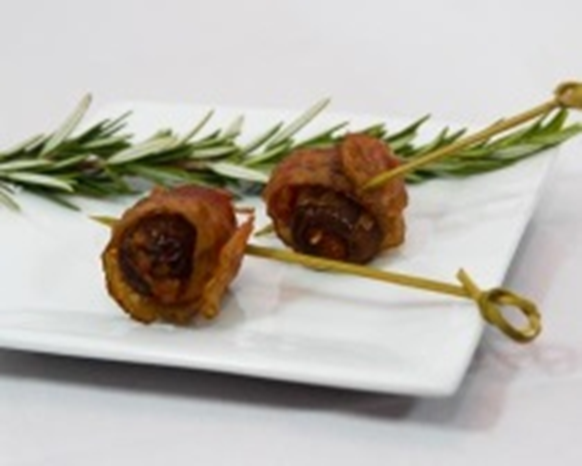 Easy to put together, Chorizo Stuffed Dates Wrapped in Applewood Smoked Bacon, is a meaty appetizer that’s sure to please a crowd with it's sweet, salty and spicy notes! Just pop one of these in your mouth for a burst of all its flavors and textures. •	Remove the casing and cook the chorizo in a pan over medium heat for 5-6 minutes, breaking the chorizo into chunks until the chorizo is bubbling. Transfer to a paper towel-lined plate. •	Once the chorizo is cool to the touch, stuff the dates carefully with it and wrap each date in half a strip of bacon and secure with a toothpick. •	Place on foil-lined baking sheet and bake for 15 to 18 minutes, turning the dates halfway through to cook the bacon evenly. Serve warm or at room temperature. •	Sear the cubes of beef tenderloin in olive oil in a large skillet over medium-high heat, on 2 sides, only until deep golden brown. Transfer to a plate to cool. •	Add the mushrooms to the same skillet and cook for about 5 minutes. Add the shallots and continue cooking until mushroom mixture dries out, is golden brown and shallots are soft. Remove from heat and cool. •	Preheat the oven to 400 degrees F. Line a baking sheet with parchment paper. •	Roll the puff pastry. Put a teaspoon of mushroom mixture on the pastry, evenly spacing them. Top the mushroom mound with a piece of beef, seared side up. With a sharp knife, cut the pastry into even squares around the meat and mushrooms. 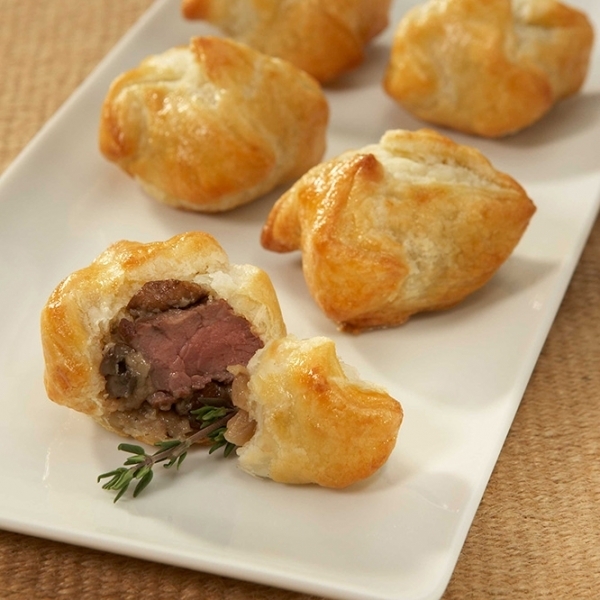 •	Pull 2 opposite sides of pastry up over each beef piece, and then fold the ends over the top to make a packet. Invert the packets seam side down on the baking sheet and press them lightly to seal the pastry. •	Bake the Wellingtons until golden brown, 20 to 25 minutes. Cool at least 10 minutes before serving. 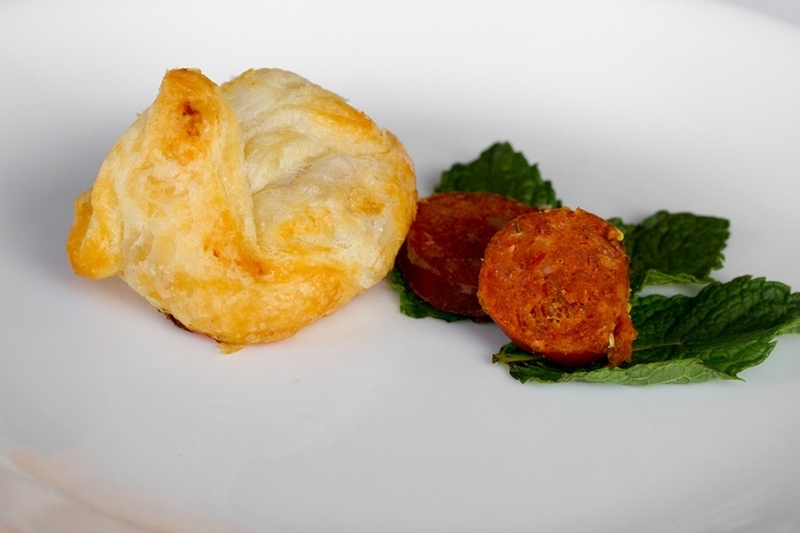 Andouille Sausage En Croute is an exciting appetizer that combines chunks of Cajun spiced Andouille sausage and zesty pepper jack cheese, topped with jalapeños, all baked inside golden puff pastry. •	Preheat the oven to 375°F and line a baking sheet with parchment paper. •	Roll the puff pastry and cut into even squares. •	Place a piece of cheese on the pastry and then a piece of sausage on top of the cheese and top it with a piece of jalapeño. Pull 2 opposite sides of the pastry and then fold the ends over the top and pinch the seam to seal. Place it seam side down, to a prepared baking sheet. Brush the tops with the egg wash.
•	Bake in a preheated 375° F oven for 30 to 45 minutes, or until golden brown. 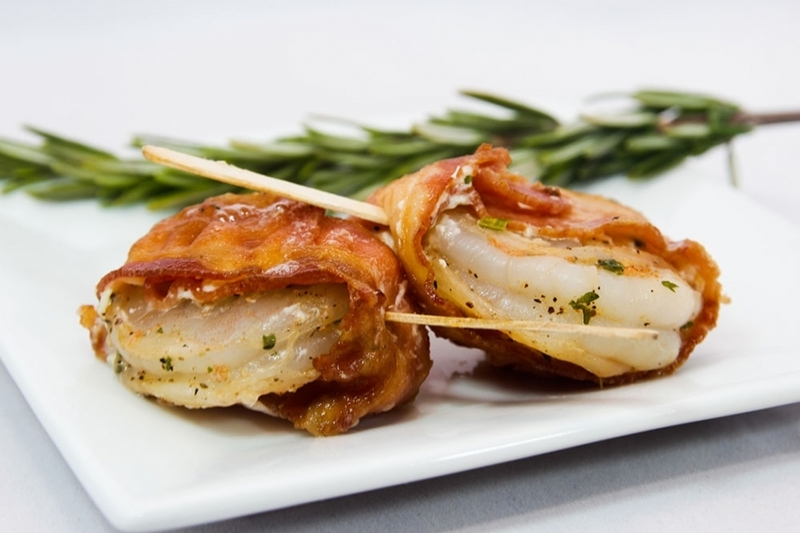 Who can resist these juicy and tender Casino Shrimp marinated in spicy casino mix and wrapped with Applewood smoked bacon? The perfect combination of surf and turf served on a knotted pick. •	Coat the shrimp in spicy casino mix and marinate in the refrigerator for 20 minutes. •	Remove each shrimp, wrap with a piece of bacon and secure with a toothpick. Spoon any remaining marinade over the shrimp. Bake for 12-15 minutes. Rotate baking tray 180 degrees halfway through the baking process until the bacon is slightly crisp and the shrimps are cooked through. A sweet Mediterranean dessert that everyone will love, Baklava is a rich, sweet dessert pastry made with layers of filo filled with chopped nuts sweetened and held together with syrup or honey. •	Make the syrup by adding water, sugar, and honey to medium-sized saucepan and bring the mixture to boil over medium heat. Simmer for 15 minutes. Add lemon juice and rose water and turn the heat off. Allow the mixture to cool. •	Preheat the oven to 375 F. Butter the bottom and side of a rectangle dish. •	Lay two sheets of phyllo dough inside the baking dish. Spread one tablespoon of butter on top. Stack two more sheets onto the buttered sheets followed by another tablespoon of butter. Repeat until you've used up 12 sheets. •	Spread an even layer of ground pistachios on top of the twelfth layer. Brush the top of the nuts with butter. •	Stack with another 10 layers of sheets and a tablespoon of butter every two sheets. 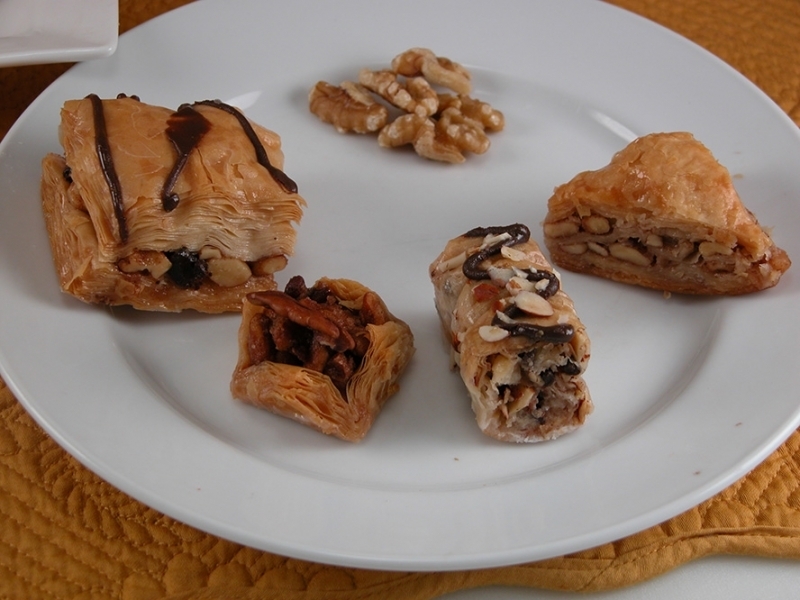 •	Using a sharp knife cut the baklava, only halfway until you reach the layer of nuts. This will ensure only the top part rises. •	Bake for 25 minutes at 375F. Turn the oven down to 325F and bake for another 30 minutes. Cool at room temperature for 10 minutes. •	Once it’s cool, re-cut the baklava all the way down. With a tablespoon pour the lukewarm syrup evenly along the cut lines. Too stressed out after all the holiday entertaining that you’ve obviously slaved over to entertain family and guests and are just too dog-tired to cook? Fret not! 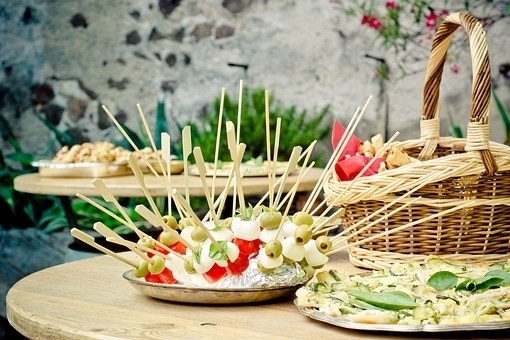 If you want to just kick back and have some winter fun before the weather changes, we at AppetizersUSA provide all of the party appetizers above along with a host of other ready-made appetizers (very classy and very exciting), readily available and delivered at short notice, to help you host stress-free parties.